Reactive maintenance is nothing more than reacting to failed tooling or equipment by restoring its intended function. For example, when a technician or quality engineer observes an unacceptable burr height on a stamped part, he summons the toolroom to replace the punch. This restores the tooling to its intended working condition so that production can resume. Many companies rely solely on this type of maintenance operation—acceptable in limited circumstances, but typically a very costly way to operate. Breakdowns become unpredictable; labor and material resources cannot be planned in advance for repairs, sorting of suspect parts or replacing defective product maybe required; the shop may have to pay premium rates for unplanned overtime; expedited shipping costs may be incurred; and the shop may experience delayed downstream processes. Most importantly, tooling and equipment life are not being maximized. By the time visible, audible or other events signal maintenance to react, the tooling or equipment likely has been damaged. In summary, companies that rely on reactive maintenance generally expend more labor and material resources than those practicing preventive maintenance. Preventive maintenance (PM) consists of formal procedures and tasks designed to prevent unplanned breakdowns, and to ensure the proper operation of equipment and tooling. Shops schedule and perform PM tasks predetermined by use of owners manuals, industry standards and guidebooks, and by evaluating environmental conditions, equipment criticality, impact on safety, past experience, etc. PM tasks include changing lubricant; replacing consumable parts; and cleaning, adjusting, inspecting and testing tooling and equipment. In the press shop, an example of PM is replacing punches at a predetermined interval (number of hits) to help ensure production of burr-free parts. A sound PM program keeps equipment running in good condition, and helps to extend the period between breakdowns. It also helps managers plan and budget for replacement parts, and schedule the necessary work at predictable and convenient times. This translates into cost savings. However, while a PM program provides many advantages over a purely reactive program and will decrease the number and frequency of failures, it will not necessarily prevent catastrophic failures. There also are adverse consequences of PM—over-maintenance, for example. Here, a shop performs unnecessary or ineffective maintenance. For example, consider a PM schedule that requires changing or sharpening of punches every 50,000 hits, regardless of the condition of the punch point. Conversely, shops may under-maintain their equipment when following a strict PM regimen. Here, failure conditions may exist but remain unidentified and uncorrected in a timely manner. For example, consider stamping a material with yield strength at the high end of its acceptable limits, which requires punches to be changed more frequently than is prescribed by the PM schedule. Predictive maintenance (PdM) improves on PM by using actual equipment performance data to determine when maintenance should occur. Shops schedule PdM tasks based on gauging deteriorating operating conditions or rate-of-decay. With this strategy, periodic or continuous monitoring detects the onset of wear or degradation. Technicians use this information to predict potential problems and schedule the required maintenance. An example: installing force transducers behind punches to monitor punching forces. As punch points wear, the force required to produce the required hole increases. A critical force, established for each punch, can be used to signal the press technician to sharpen or replace a punch or series of punches. PdM and PM represent very different strategies, even though the two terms often are used interchangeably. PM plans prescribe time-based activities (number of cycles, number of hours, etc. ), while a PdM plan comprises event-based activities determined through the acquisition of data (force, temperature, vibration frequency, signature analysis, etc.). 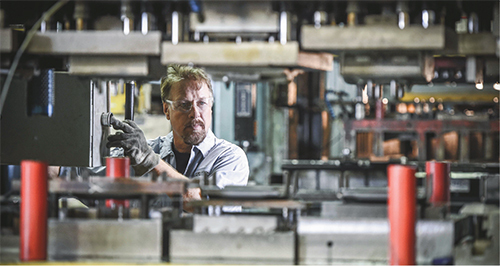 The press shop’s PM schedule requires changing or sharpening punches every 50,000 hits. It undertakes process improvements to improve punch life and reduce tool-maintenance costs. It finds that by investing in higher-quality powdered-metal tool steel and by applying an engineered surface coating, punch life increases to 100,000 hits between maintenance. Pretty good, but by practicing RCM the shop can do better. For example, design of experiments and root-cause analysis might reveal that most of the punch wear occurs due to excessive tipping moments, caused by large clearances in the press connections and slide-guiding system. Maintenance on the press restores the machine clearances to factory specifications, reducing slide tipping to within acceptable limits and, in turn, reducing punch wear. As a further cost savings, the toolroom replaces the expensive powdered-metal tool-steel punches with the original high-speed-steel punches, and eliminates the added surface coating. At the same time it maintains 200,000 hits between maintenance.